Seven Tips To Help You Launch and Succeed In Facebook Live Videos — Ai Addyson-Zhang, Ph.D. 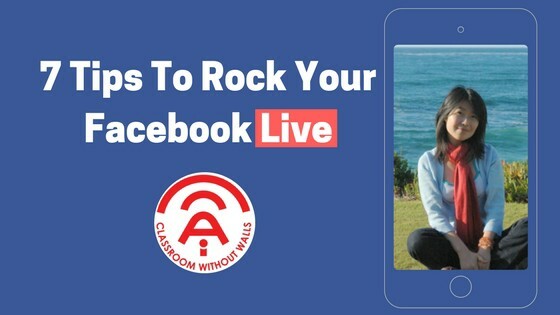 In June 2017, I launched my Facebook live show, Classroom Without Walls: Using Technology to Reimagine Education, where I interview leading professionals and educators regarding issues related to social media, technology, education, and innovation. In this article, I will dissect my journey and share with you my top seven tips to launch and excel on Facebook live. Yes. You read it. When you are starting out on the live streaming journey, you do not need to invest in fancy equipment at all. Maybe this sounds counterintuitive, but all the fancy tools in the market are simply barriers to help you start on your own live-streaming journey. Do I have a Wifi connection? Do I know what to talk about? If you answered yes to all of these questions, you are ready to start your live-streaming journey. When I started my Facebook live show, I had nothing but my smartphone and a wifi connection. The key is as long as people can hear and see you clearly, you are good to go. Nothing is more important than getting started and producing content of value for your audience. You will evolve as you start doing more live shows. Once you build a community, your content will continue to improve as you start to hear feedback from your audience and understand what type of content performs well and then produce more of it. This is exactly what happened to me. For my very first Facebook live show, I interviewed a professor who uses Snapchat as a teaching tool to engage students and to teach his psychology class. He was also interviewed by NPR. I was elated that he agreed to be on my show. At the same time, I felt pressured to do a good job. However, technology-wise, everything that could go wrong, did go wrong. Everything that I wanted to happen didn’t happen. All the articles and videos I read and watched regarding how to go live helped but still didn’t prepare me enough. I used Zoom for my very first Facebook live interview. Although I used Zoom several times before this point, I didn’t know that using Zoom as a guest was quite different from using it as a host. Eventually, I had to give up on using Zoom and did the interview by using Facebook’s native live feature. It got the job done but was not how I imagined the first show would happen. What I learned from my first live streaming is experience is the best teacher. Regardless how much you learn, read, or watch, you can only prepare yourself to a certain extent. It’s the process of doing it that teaches you the most valuable lessons. Don’t overthink. Getting started is the key. Practice and rehearse ahead of time, but be prepared for things to go wrong. Don’t panic and have a backup plan. When you first go on-air, it is very tempting to say things like, “can you guys hear me?” or “let’s wait for a few minutes until more people join us live” or say other things that simply fill blank space. These are not desirable ways to start a live show. If you truly want to connect with your audience, you can go live a few minutes prior to your show’s start time and have small talk with your audience. Otherwise, just go live and start your show when you scheduled it. And don’t ask your audience if they can hear you or not. Your audience is intelligent and if they cannot hear you, they will tell you directly. Finally, if you promise your audience to go live at 1 PM then go live at 1 PM. Start on time even if no one shows up. Don’t feel discouraged by the numbers. In fact, when you’re starting out with Facebook live, don’t focus on numbers. Everyone has to start somewhere. Focus on producing quality content instead. Below is the intro I use for my own Facebook show. My introduction helps fulfill two objectives. The first is to tell people a little bit about my show and share my “why.” The second one is to introduce my guest and tell the audience what they are going to learn from the interview. Hello everyone. Welcome to my weekly show, Classroom without Walls — Using Technology to Reimagine Education. My name is Ai. I am the host of this weekly show. I created this show because I believe our society has changed a lot. Social media and technology play a huge role in our changing society. As educators, we need to change how we teach and interact with our students. On this show, I interview leading professionals and educators such as ____ [mention the guest’s name] regarding topics related to social media, education, and technology. If you are new to the show, thank you for joining us live. If you are a returning attendee, you know how much your support means to me. If you are watching this on replay, thank you, future people, [don’t forget that there will be people watching the replay]. Today, I am so honored to have ____ join us live. _____ is a renowned _____ [introduce your guest] and will share will us ______ [what the audience can learn from your interview]. Even though this seems like a lot when it’s written out, it doesn’t take me more than 1.5 minutes to say everything, and definitely helps set the context for my show. If you are hosting a live interview, please make sure you are engaging with the audience who join you live. Sometimes, I become so focused on my conversation with my guest that I forget I have a live audience joining me. To remedy this, here are some ways that I have engaged my live audience. At the beginning of the live show, I ask my audience to share in the comment section where they are joining us from. During the live show, if I am asking my guest a question, I also post the question to the live audience and ask them to share their experience and insights. Even better, invite your live audience to join you and your guest to have a live discussion. I pin my BeLive link in the comment section so that people can simply click on it and join us live. Sometimes, I do giveaways and select winners among those who share my live show on their social media channels. The part I love best about doing Facebook live shows is that you are not simply disseminating information, but actually co-creating content between you, the guest, and the live audience. The more interactive and participative you can make your live show be, the better it is. Make your audience feel that their voices are heard and opinions are valued. I run my Facebook show on a weekly basis, every Wednesday at 5 PM, EST. I love having a consistent schedule so that my audience knows what to expect. And this level of consistency also helps my audience develop a habit of consuming my content. So, decide on a time and frequency that work best for YOU, and commit yourself to it! If you are a content creator, you know that creating content takes time. Running Facebook live shows is no exception. From finding and researching guests, scheduling, creating graphics, developing interview questions, to actually running the show, it takes at least four to five hours per week for me. Think carefully before you make a decision; and once you make up your mind, commit to it! Once a Facebook live show is over, don’t let it simply sit idle on your Facebook page. You need to actually promote your content before, during, and after a live show is over. For example, before I go live each week, I create a graphic to promote my show on Facebook (my personal page, public page, and a group that is linked to my public page), Twitter, Instagram, and LinkedIn. I also do stories to promote my show. During the show, ask your audience and guest to share your show on their social media sites. After a show is over, repurpose the content by writing blog post recaps or creating videos clips, quote images, or infographics to share your content. I recently listened to a podcast episode, where the host, Amy Porterfield, interviewed an expert blogger, Julie Solomon. Julie shared an 80/20 rule, that is, she spends only 20 percent of her time creating new blog content and 80 percent of her time promoting her blog content. Repurposing my own live content is something that I need to improve on as well. I didn’t see a need to invest in better equipment to improve my overall show quality until only recently. After lots of research, I made two purchases. In November 2017, I purchased a Neewer Ring Light and cannot recommend it enough. The ring light completely lightens up my face when I go live, especially when I have to go live late at night or early in the morning, where there is insufficient natural light. My second one is a recent purchase of an expensive microphone. This particular microphone has been recommended by several of my social media friends who do podcast regularly. However, I want to remind you of what I said in my first point: an expensive microphone is not a prerequisite to launch a Facebook live show. Before this purchase, I had been mainly using the earphones that came with my iPhone. I am currently at Level two. I use BeLive to go live on Facebook. Before I started using BeLive, I tried a combination of Zoom and Facebook’s native live feature. Each of them has its strengths and weaknesses but were not exactly what I was looking for. BeLive so far is my favorite choice and works extremely well for my live-streaming interviews. If you want to learn more about the differences among these third-party tools, read my blog post here. I hope the seven tips that I shared here can help you launch your Facebook live show. Content creation takes time, regardless of whether you are writing blogs, creating visuals, or hosting live shows. The key is being consistent, staying committed, and keeping your audience’s needs in mind as you are producing content. Slowly but surely, you will achieve what you want to accomplish. This article was originally guest published on Corina Manea’s Website.